I have worn it every day... I find myself reaching for it, feeling the hammered surface and the shape of the cross under my fingers and it brings my heart back there. Nakumpenda, or nakupenda... I love you. Yes, Africa. I love you. And Mom... I love you, too. It all started while we were talking to a German woman at the beautiful Tloma Lodge. She was just beginning her African adventure, and we grasping tightly to the last few hours of ours. I noticed she had Africa around her neck… and I couldn't keep my eyes from it. The thought of having Africa around my neck made me smile, and I hoped that I might find something similar. I was instantly in love, and began digging all over Kristen's blog, because what were the chances of Wendi actually winning? I had already read some of Kristen’s trip to Africa, but I had not seen the necklace that her husband had created for her in honor of Valentine’s Day and her own trip to Africa. After finding out all I could, and waiting a few days to see if Wendi had won, I contacted Kristen… It's so funny that you would ask about those necklaces! This is still a secret, but our family is partnering with Maureen, a Compassion Leadership graduate, to open a maternity home for pregnant girls living in the streets of Kenya. We just formed a 501c3 and are making the necklaces to benefit the home. I ordered two… one for my Mom, and one for me. Kristen's husband made them and they were shipped faster than I imagined. And in the waiting, I could barely talk to my Mom… wanting to shout it out and keep it a secret all at once. But then… the necklaces were here, and I was hanging mine around my neck and admiring it in the mirror and knowing what I had really known all along… that when my Mom opened her gift she would cry rivers of tears. Tucking mine away in my pocket, I shouted hello from her door and then fell into her arms, relieved that I could place this gift into her hands… knowing that it was such a small thank you for the adventure of a lifetime. She pulled the ribbon and it unfurled gently onto the counter, then lifted the turquoise lid and then the cotton batting… without a clue to what might be waiting beneath. Seeing the chain first, she lifted it from the layers and then she saw Africa… and crumbled. The tears did not sparkle in her eyes and she did not smile at the gift… rather, there was a heart-wrenching sob that came from deep within, that kind that takes your breath away because your heart is filled with so much love that it actually hurts a little, and tears that ran rivers from her chin. I love it. I more than love my necklace........I'm going to have to find something to go with it when Laura and Cam get married. You are right. I LOVE the story. So cool. Hugs. Oh, Dawn. What a great story. And, like so many times before, I'm sitting here with my own rivers of tears. I love the way you so often touch my heart. I think it's because you let things touch YOUR heart, and then you share from that tender space. Love your necklace! Love you! It's a beauty, and so is the story that goes alone with it. That makes it extra special. Ok, darn it, I should have known to read this in the morning BEFORE I put on makeup. I felt your Moms tears. I feel your heart. Oh wow, what a great, great story. Beautiful indeed. You were meant to have these necklaces...both of you...I knew it the moment I saw them (though how cool would it have been if I could have won one and sent it to you?!? Of course, I was worried I wouldn't win, and that is why I decided to share the link). I'm glad that I could be a teeny little part of the story of the Africa necklaces! I LOVE the connection between you and your Mom, and I understand it because I am lucky enough to share the same bond with my own mother! I think the BEST part of this story is the fact that you are both able to have a little reminder of Africa to wear near your heart while helping an even bigger project in Africa at the same time....so cool! Just beautiful. What a wonderful post. dawn ... so perfect! just perfect. gifts that give ... and all the love, emotion, memory ... just perfect! Sniff. Sniff. What a great post! I just somehow stumbled along this blog, i have to clue how. I am 16 and last summer i went on a month long mission trip to Kenya, and I was transformed. I fell in love with everything about that place, the children, the smell, how vividly I can see the lord in the Kenyans eyes, just everything. 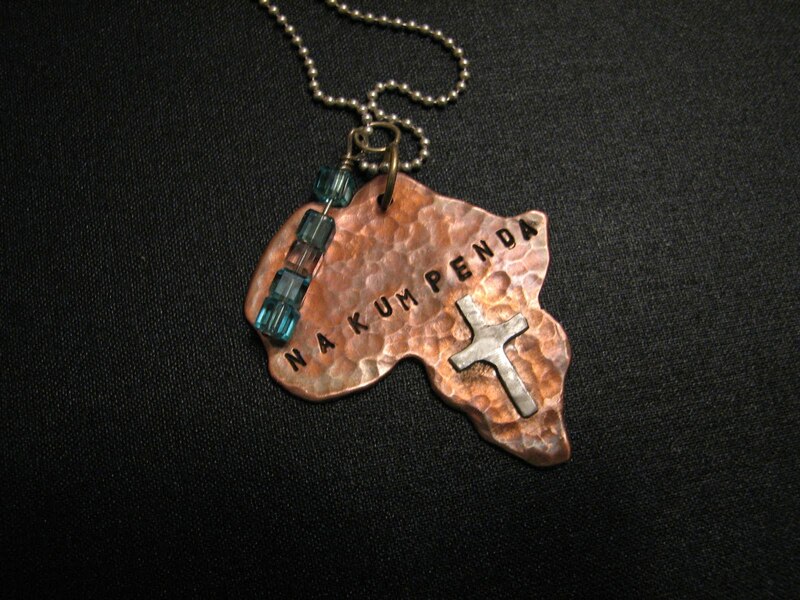 While there I did learn a bit of swahili, and I just love that this necklace says Nakumpenda, i love you. I would LOVE to somehow get this necklace for myself and for my sister in christ that i met on my trip, who is now my best friend. Would you be able to tell me how I can buy this necklace or something? I love the story behind this as well, God acts in crazy ways =) God bless!